WASHINGTON — Now that both House and Senate Republicans have released their respective tax bills, the two legislative chambers have begun their staring contest over which of the policy details will make it into the final product. After the GOP’s dismal electoral results in last Tuesday's elections, where Democrats won high-profile contests in Virginia and New Jersey as well as minor gains elsewhere in the nation, the stakes are even greater for the party to usher a tax overhaul bill across the finish line. But what’s good for the party as a whole isn't good for every individual member, and the Senate version presents political peril for some moderates in the House who are threatening to withdraw their support if the final bill doesn’t accommodate their concerns, putting the entire effort in jeopardy. The most glaring example is on the state and local tax deduction. 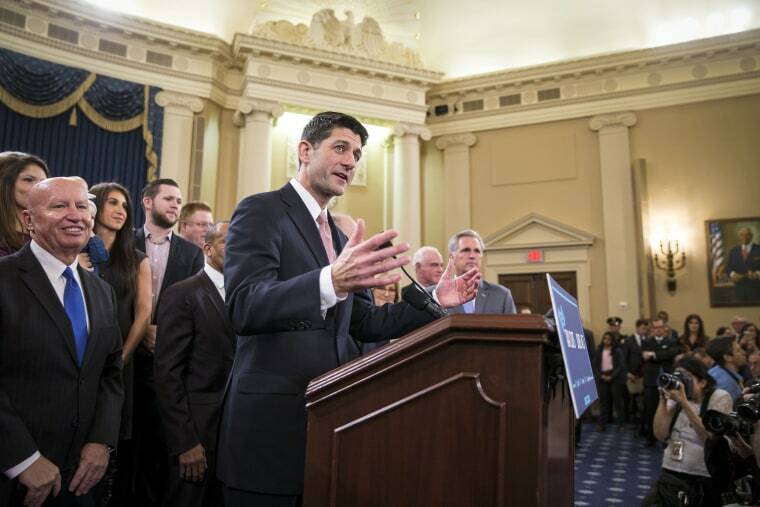 Republican leaders in the House, who can only afford to lose the support of 22 votes for a bill to pass, accommodated their members who represent districts in larger, Democratic-leaning states where those taxes are higher, by allowing taxpayers to deduct up to $10,000 of their property taxes from their federal tax bill. But the Senate, whose members nearly all represent states where those priorities are lower, completely eliminated the deduction, a move that gives them $1 trillion to pay for corporate tax cuts without adding to the deficit. Senate Democratic Leader Chuck Schumer said this week's elections demonstrated the tough choices for those moderate House members. "The Republicans should look at the elections (Tuesday) night and it should be a giant stop sign for their tax bill. Where did they get clobbered? In the suburbs. Where does the tax bill clobber middle and upper middle class people? In the suburbs," Schumer said. Blue-state House Republicans say they have warned House Speaker Paul Ryan that they will not support the bill if the Senate doesn’t compromise on the issue. Without the property tax deduction, many upper middle class tax payers are set to see an overall tax increase. More than 70 House Republicans represent high-tax states and while not all of them have said they oppose the bill, the margin for defections is narrow with with no Democrats expected to support the legislation. Rep. Tom Reed, R-N.Y., said he feels good about the House tax bill but said that if the Senate doesn’t budge on the state and local tax deduction, he won’t support it in the end. “We made our position well known. If the Senate wants to repeal the deduction in its entirety, I’m not going to be interested in supporting that,” Reed said. Many of the Republican House members most vulnerable to challenges in next year's midterm elections are the same members concerned about the state and local tax. They represent districts with slim GOP majorities. Rep. Darrell Issa, R-Calif., who represents an upper-income district outside San Diego, is facing one of the most difficult reelections in the House. He didn’t even wait for the Senate bill to be released before announcing his strong opposition. “Their theory that everyone gets a tax cut doesn’t work because not everyone gets a tax cut,” Issa told reporters of leadership talking points to sell the tax bill. The party, however, is facing pressure from donors and their constituents who are upset that the governing party has failed to deliver a major legislative accomplishment. A House Republican campaign official said that donors have re-opened their checkbooks once they saw momentum on tax overhaul. But Senate donors, who just released its bill on Thursday, have seen a major decline in donations since their failure to pass health care. Rep. Mark Meadows, R-N.C., said that the message from this week's elections is that Republicans must to pass legislation their constituents want, not just pass a bill. “That critical message is we need start making our legislating match our campaign rhetoric,” Meadows said. The problem for a Republican Congress that is trying to avoid the kind of ideological divisions that doomed attempts to reform health care earlier this year is that Meadows’ constituents in rural North Carolina aren't concerned about the elimination of the state and local tax deduction while voters in districts like Reed’s in upstate New York district prioritize the issue.